My Story For You 为你我愿意热爱整个世界 is a drama adaptation based on a novel by Tang Jia San Shao 唐家三少 that tells a realistic story between Zhang Changgong and Li Muzi, portrayed by Luo Jin and Zheng Shuang . 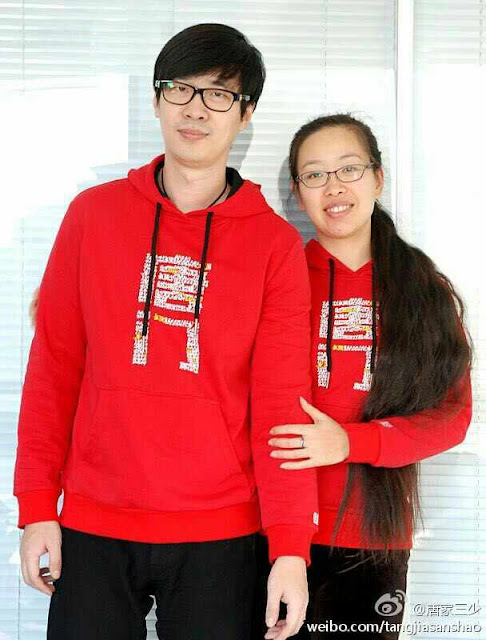 Their characters are actually modelled after the author Tang Jia San Shao and his wife. On September 11, Tang Jia Shan Shao whose real name is Zhang Wei wrote on weibo that his Muzi has left. His wife whose real name is Li Mo has passed away after battling cancer for almost three years. While I never saw the drama nor read the novel, it is very sad to hear. My Story For You was the author's declaration of love towards his wife and the first time he wrote their 17-year love story into a book. In the past, Tang Jia San Shao had said that it was while writing the book that they first discovered his wife had cancer. That is the reason why he changed the title of the book from '为了你我愿意放弃整个世界 (lit. For You I Am Willing To Give Up The World) to 为了你我愿意热爱整个世界 (lit. For You I Am Willing To Love The World). Luo Jin also wrote a thoughtful message on weibo to say that Zhang Changgong and Li Muzi's memories have filled his mind since last night. He writes, "Having experienced what you experienced, I share your sentiments. For her, you must love the entire world." Tang Jia Shan Shao posted another weibo today, "I miss her, take me too...." There isn't really anything anyone can say that will help but I sincerely hope he is able to heal with time. Deepest condolences to him and his family. I haven’t finished the drama. I watched like 1ep then find it very slow paced so didn’t continue. I will probably go back and continue watching.
. I don't like Chinese drama but this drama make me to want to watch more of Chinese movie. It educational. I think for the author, the end it just how he would have love his family to be but it didn't work in real life. I'm so crying now that I read his wife dead. In the drama, the wife survived serious heart disease and a benign tumor. The drama did not portray the later cancer so that the drama could have a happy ending. If you follow the lives of people long enough, it will end in some inevitable deaths. My guess is the environmental pollution in china probably contributed to the cancer aside from the usual unhealthy diet in current china of refined substances like oil and overeating of animal products. So many china dramas are always promoting deep fried chicken and sugar water drinks (also sugar yogurt drinks). You’ve just described everywhere in the world. In the drama, the author had to survive depression bec of unemployment. Hopefully, the author will survive depression again. OMG, I feel so sad, I bet Zheng Shuang must be emotional sadden by this too. She is a emotionally delicate woman. I’m sorry and your point is? Should he have made her stop eating those foods, drinking wine, breathing air? She already passed away, stop trying to use that as a chance to get all self righteous about how healthy your habits are. That is so sad. He must be heartbroken. My sincere condolences to him and his family. Stay strong and keep loving the whole world!